I just want to say that I love your diary, your NOTBPW vs CGC diary was the diary that made me begin to read diaries of TEW, probably one of the best I have read, and I havent found another diary like that, so when i saw this one, i knew this was going to be good. "Logan", ohhh I know where you are going with this, and it is awesome. PS: Sorry in advance, Im a little sharp toung, nothing i comment i do it to offend, i just write it as it comes into my mind, blunt without filters. Thank you for this, I really appreciate it It's nice to know I've influenced people, and possibly helped them find other diaries too! As for Logan... I don't think you dooooo Maybe you could tell me what you think is going to happen and I'll tell you if you're right! Don't worry about the sharp tongue, as long as it doesn't offend anyone, I'm okay with it. I'm quite hard to offend, but others are easier, so keep it as clean as you can in that respect. A true test for Solomon Gold here, who is only 21 years old. He was up against an established midcarder in Hugh Ancrie, but he has a veteran as his tag team partner now. The Natural has taken it upon himself to train 'The Hillbilly Heartthrob', and he was also instrumental at ringside to help his young protege. Hugh Ancrie attempted his 'Crying Game' (Rolling German Suplex) finisher, but Gold landed on his feet, and locked in his 'Gold Standard' Sleeper Hold, and Ancrie tapped out!! 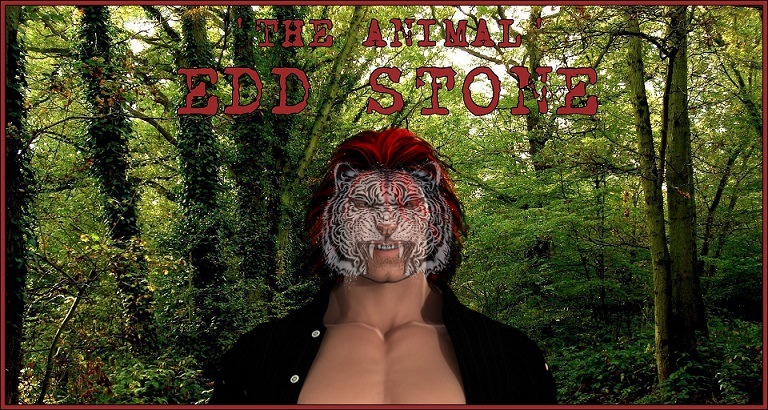 Next up, we were reminded about how dangerous 'The Animal' Edd Stone can be... In recent months, he has won the NOTBPW Tag Team Titles with his Brother Duane Stone, before turning on Duane, attacking him, and then defeating him at Mid Summer Madness... He also fought his Brother-in-Law Sean McFly... He lost that match, but did a lot of damage to the 'Best in the World' in what was McFly's final match in NOTBPW... In the video, we cut to a post-match promo from Edd following the brutal fight he and McFly had... With a blood soaked bandage wrapped around his head, Edd said that he didn't lose against McFly...!! Finally... After over ONE YEAR on the shelf... It was time for the return of the man known as 'POISON'... He arrived in NOTBPW in May of 2016, and after an undefeated month, he quickly began to establish himself as someone who could carry the upper mid card on his back... However, he had his clock cleaned in a singles match and was out with a major concussion for 13 months!! He's back now, and his first opponent was former two-time NOTBPW Television Champion Erik Strong!! This match proved just how quickly a match could end out of nothing. 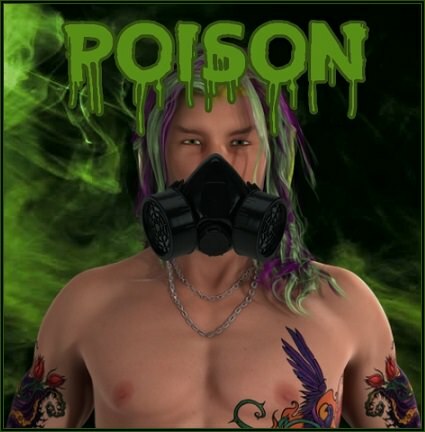 Erik Strong and POISON had an open, even, contest for around 8 minutes, but suddenly, POISON locked Strong in his 'Antidote Web' finisher, and made Strong pass out!! Derek Frost asked Alex DeColt if he watched the match... To which Alex replied: “NO”... Frost knew then that Alex didn't recognise Logan... But he told him he might want to go back and watch some footage... He told Alex to be careful, if he doesn't want his 'secret' to come out...!! This made Alex REALLY angry, but he was able to see a solution... He allowed Frost to pick Aldous or Mutant... (he picked Aldous)... to fight 1 on 1 later tonight...!! Amazing match between these two solid performers who are in their mid 30s. This past Saturday, Thrill Seeker made his return after a month off following an injury to his tag team partner Jacob Jett. On Saturday, Seeker lost to Tim Westybrook in a competitive match. This match was also competitive, but this time Seeker had a point to prove. He flew into action late on and delivered a number of flying kicks. In the end, he hit the 'Daredevil Drop' from the top rope on a very game Akima Brave! Backstage, Katie Cameron was interviewing her guest: 'Awesome' Wade Orson... The young Brit has had mixed fortunes since arriving in NOTBPW, but it looks like he's now finally gotten past his rival Lord James King... 'The Gentleman' made life difficult for Orson upon his arrival in Canada, but Orson rose above it, and last week he defeated King in a brilliant Street Fight... Cameron asked Orson what's next... Or rather, who's next, for Orson... He wasn't 100% sure, but he knew he wanted to find success in Canada sooner rather than later, and that means Championships... But before he could finish his thought, he was knocked over from behind!! POISON stood over his victim with a snarling look on his face... He told Orson that HE is next for the British star... It's a case of 'Out of the Frying Pan, Into the Fire' for Orson as he's gone from one dastardly villain to another... Orson tried to get up to fight back, but POISON delivered a slap across the face that turned Orson around 180!! POISON then locked Orson in his 'Antidote's Web' (Tazmission) finisher, and Orson passed out a few seconds later!! What a return it's been for POISON... He defeated Erik Strong earlier tonight, and now he's gone after, and taken out Wade Orson!! Derek Frost will feel like this match was a punishment, more than an opportunity to get revenge on Aldous Blackfriar and Mutant!! Frost was out there alone tonight due to Dan DaLay's concussion, and he was in trouble right from the start following a brutal lariat on the outside of the ring from Aldous's bodyguard Mutant! Aldous won comfortably in the end when he locked Frost in his unbreakable 'Batwing' submission hold, and Frost tapped! Aaron Andrews and Danny Cavanagh are at similar levels in terms of their position on the roster, but Cav is so much bigger, and a lot stronger! 'Mighty' Cavanagh used his might to throw 'The Ace' around the ring. At one point, Andrews landed face first on the ropes following a throw by Cav. A large welt appeared on his chin, and Cav targeted it from that point onwards. In the end though, Cav fell victim to Andrews' 'Hot Shot' finisher, and he was pinned!! 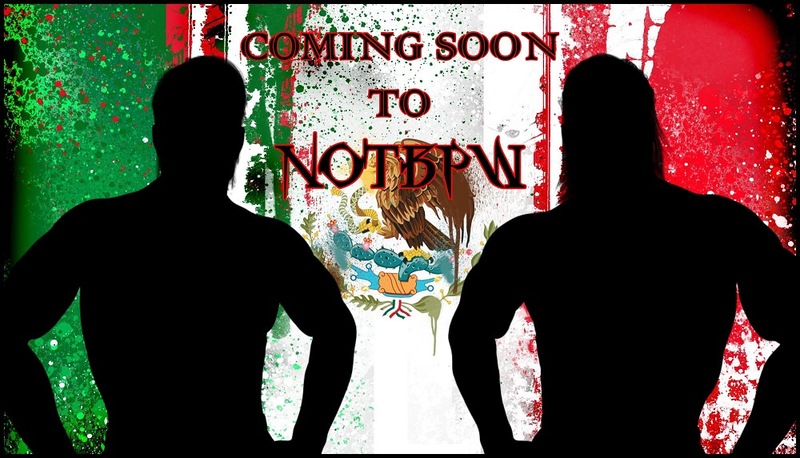 Next up, we learned that in two weeks, we're going to see a HUGE match here on NOTBPW Championship Wrestling... NOTBPW Television Champion James Hernandez will take on NOTBPW Canadian Champion Gargantuan!! 'Mainstream' James Hernandez and 'The Monster' Gargantuan have NEVER fought 1 on 1 before... And both men have been on an incredible roll lately... Hernandez hasn't lost on television since March of this year... He's been Television Champion since February... Meanwhile Gargantuan hasn't lost since signing for NOTBPW... That's around 18 months now... In two weeks... It's going to be 'Streak versus Streak'... and Champion versus Champion!! The two DeColt Brothers have been at each others throats for much of this year, but tonight they looked on the same page for this tag team main event! Their teamwork was the reason they were able to score the win, because without it, they would have struggled against the formidable Mavericks! John Maverick and Julian Watson tried to isolate Steve DeColt, but he's a hard man to tie down for long. He managed to tag in 'The Wild Man' and Jack DeColt took control! It was an even fight from then on, but the DeColts had enough about them to take care of business when it mattered most. Jack sent Maverick flying over the top rope, and went over with him after a brutal lariat! This left the door open for Steve DeColt to hit his 'DeColt Stampede' on Watson! The challenge was set, and now it's over to Gargantuan to answer it... The show ended there... but next week should be a huge show... Harrison Hash will battle Tim Westybrook... Sonny Wildside will go 1 on 1 with 'Shooter' Sean Deeley... and we're going to find out the identity of the two Mexican Megastars that will be debuting in a couple of weeks... We'll also hear from both James Hernandez AND Gargantuan on their future 'Champion versus Champion' Match... And Gargantuan will respond to Steve DeColt's challenge to go to 'TOTAL WAR'!!! The most brutal match in NOTBPW history!!! 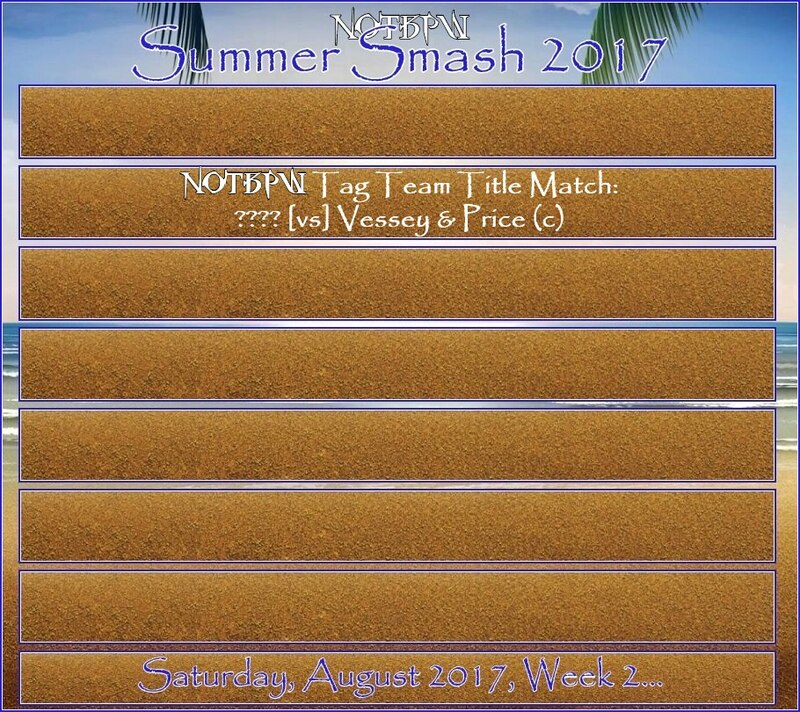 No news is 100% good news... Nobody got injured... Nobody died... Nobody failed any drug tests... NOTBPW's roster is FINE!!! We're FINE!! !